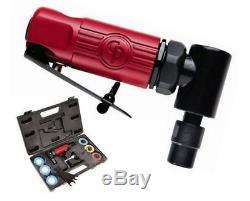 Chicago Pneumatic CP875K Compact & Lightweight Die Grinder Kit. Tyre Repair Material & Tools. Tyres - 4x4 / SUV. Tyres - Classic White Walls. Tyres - Semi Slick Road Legal. Wheel & Tyre Packages - Steel. Chicago Pneumatic Compact & Lightweight Die Grinder Kit. General maintenance applications angle die grinder. Compact and lightweight tool designed for easy maneuverability. Ideal for limited space applications. 1/4 and 6 mm collets. 90° angle head allows flexibility in tight areas. Kit includes: (1) 2" (50 mm) backing pad, (2) 2" (50 mm) coarse surface prep pad, (2) 2" (50 mm) medium surface prep pad, (2) 2" (50 mm) fine surface prep pad, (2) 2 (50 mm) 24, 36 and 50 grit sanding discs packed in heavy-duty carrying case. All prices include 10% GST. Your order will be sent via Australia Post or another suitable carrier depending on your location. If you require the item urgently, we recommend you select Express Post. Bits4Blokes is an online B2B and B2C business based in Melbourne, established in 2015. We have decades of experience in the Automotive and Engineering fields, and use this hands-on knowledge to source a variety of high quality products for both businesses and consumers alike. Bits4Blokes is proud to source only the highest quality products, produced both locally and overseas, and have aligned ourselves with some of Australia's leading and most trusted brands. And we will be happy to assist. We know you'll be keen to receive your order as quickly as possible. We pack every order carefully to ensure it reaches you in good condition. Your order will be sent through Australia Post or one of our preferred couriers. All consignments are tracked (apart from where indicated in the listing). And we will do our best to make sure you're happy. Some manufacturers prefer that end users deal directly with them, and others prefer to work through us. And we'll make sure the correct process is followed so the issue can be addressed as quickly as possible for you. Each product we sell comes with automatic guarantees that cannot be excluded under Australian law. We understand that you might need to return something to us for a number of reasons. For exchanges, we will cover the cost of sending a replacement product back to you. The item arrived damaged or missing parts. All orders leave our warehouse in brand new undamaged condition. It is important that you open your order as soon as you get it, and notify us immediately if there is any damage. Your privacy when dealing with us is crucial to our company's good community standing. We undertake to maintain all collected information in confidence and to use our best endeavours to ensure that such information is used only for legitimate purposes and is not misused. We may share information collected about you with our own employees, agents, contractors and advisors as the case may warrant. Under no circumstance will we provide, share or sell your personal information to external parties or mailing list providers. Collected information may be retained in our information systems for taxation and statutory compliance purposes and may also be used for internal marketing effectiveness assessment. Six Eastern Investments Pty Ltd t/a Bits 4 Blokes is an online B2B and B2C business based in Melbourne, established in 2015 by a highly experienced group of dynamic individuals. TYRE REPAIR MATERIAL & TOOLS. SUBSCRIBE NOW TO RECEIVE OUR LATEST NEWS AND EXCLUSIVE OFFERS. The item "Chicago Pneumatic CP875K Compact & Lightweight Die Grinder Kit" is in sale since Thursday, October 22, 2015. This item is in the category "Vehicle Parts & Accessories\Automotive Tools & Supplies\Air Tools\Other Automotive Air Tools". The seller is "bits4blokes" and is located in Moorabbin VIC. This item can be shipped to Australia, North, South, or Latin America, all countries in Europe, all countries in continental Asia, New Zealand.